The Parrot Finches are so named because of their beautiful coloration, much more showy than many finches! The Red-headed Parrot Finch is a very beautiful grassfinch. They are not real common in captivity but are not difficult to keep and breed. They do not do well as a caged pet however, but thrive wonderfully in an aviary. In the aviary they are very active, agile flyers and friendly with lots of other kinds of birds. In the wild they live in grass and brush lands, as well as abandoned plantations. They eat grass seed they find on the ground as well as climbing the grass stocks and eating the seed still at the top. They also eat bugs and insects. This grassy environment provides a large portion of their needs from food and cover, to bedding materials for their nests. Dr. Jungle says..."thanks for sharing a champion!" "This is a picture of my Champion red faced parrot finch named Pavarotti. Pavarotti is a 2 year old Erythrura psittacea. This photo was taken inside his flight. " ...Ron Cloutier"
Description: Red-headed Parrot Finches reach a size of 4.5" (12 cm). Their bodies are a bright glossy green and they have a bright red head, throat, and upper breast. The bill is black, and the legs and feet are gray. The female is similar to the male, though they sometimes have more muted coloring and the red on the face is smaller and lighter than on the male. Juveniles are dull green in color and have a dull red tail. Some may have red on their face, but the amount of red varies with each individual. Their full color is achieved at about four months of age. Distribution: Red-headed Parrot Finches are native to the Pacific Island, New Caledonia. Care and Feeding: Fresh food and water must be provided daily. A good finch seed mix will provide their everyday need of grass seeds and millets and is readily available at a pet store. They are much more a vegetarian than most of the parrot finches and should also be offered greens, green seeds, fruits, millet, chickweed, and even oats. They will also need proteins such as scalded mealworms, enchytraeids, ant pupae, and egg food. Finch treats of seed with honey, fruits and vegetables are fun for your bird too, as well as nutritious! Grit with charcoal is essential to aid in digestion and it contains valuable minerals and trace elements. Grit should be provided in a special cup or sprinkled over the bottom of the cage floor. Provide a cuttlebone because the calcium it provides will give your bird a firm beak, strong eggshells when breeding, and will prevent egg binding. The lime in the cuttlebone also aids in digestion. Provide you finch with an occasional bath. A bath dish that is 1" deep with a 1/2" of water, or a clip on bath house work well. Their nails will occasionally need to be trimmed, but be careful never to clip into the vein as the bird can quickly bleed to death. Bird nail trimmers and styptic powder to stop the bleeding are available at pet shops. 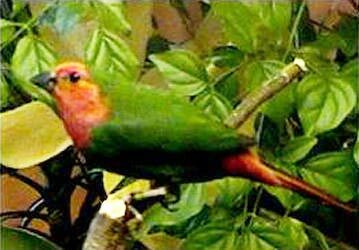 Housing: Red-headed Parrot Finches do very well in aviaries or bird rooms. The screening should be 3/8" square mesh. Dishes for food, water, grit and bathing water must be provided along with perches and nests. They cannot take extreme cold, so a minimum temperature of 65°F (18°C) would be the least they can tolerate (68°F (20°C) when they are breeding). Being quite active, they need lots of open space to fly. In their native environment grasslands and shrubbery are the norm, so they will appreciate corners with thickly planted shrubs. Plants that are not poisonous, such as fruit trees, privet, forsythia, and honeysuckle bushes will make the space more enjoyable for the finches. Maintenance: Although finches require very little time, a clean environment as well as fresh food and water daily is a must to prevent disease and illness. The basic cage care includes daily cleaning of the water and food dishes. Weekly wash and dry all other accessories in the aviary, including the perches. Social Behaviors: Red-headed Parrot Finches live naturally in groups when not breeding. They are very social. They become very friendly with many different kinds of birds and the aviary life suites them perfectly. Handling/Training: Finches are simply enjoyed for their antics and play rather than training. When you need to handle your finch to examine it or clip it's nails, place your palm on it's back and wrap your fingers around the bird with your thumb and forefinger on either side of it's head. Finches rarely bite, and even if they do, they do not have a harmful or dangerous bite. Activities: Red-headed Parrot Finches are active, flittering around and twittering most of the day with a few short quiet periods. Breeding/Reproduction: Red-headed Parrot Finches if fed a good diet are not difficult to breed, but do not do well in cages. They are best bred in an aviary. It is difficult to pick out pairs so breeding in small colonies works best. In the wild they nest in holes in rocks, trees, bushes and even in the recesses and beams of buildings. They like on enclosed or semi-open nesting box. Nesting materials can include dry leaves, grass stalks, and coconut fibers but they like long fibers best. The female will lay a clutch of 4 to 6 eggs. The male and female will both help build the nest and incubate the eggs and they will hatch in about 14 days. The parents will feed the young proteins rather than vegetable foods, so offer ant pupae, egg food, and mealworms. The young leave the nest about 21 days after they hatch and in another two weeks will be on their own. Banding finches is generally done on the 12th day. Potential Problems: Red-headed Parrot Finches are hardy birds and almost all illnesses can be traced to improper diet, dirty environment, and drafts. They are also susceptible to cold, and should be kept at temperatures above 65°F (18°C). A balanced diet and plenty of exercise will prevent most illnesses. Know your birds and watch for real drastic changes as indications of illness. Some signs of illness to be aware of are droppings that are not black and white, feathers that are ruffled, lack of appetite, wheezing, and acting feeble and run down. Some of the common illnesses and injuries your finch could contract are broken wings or legs, cuts and open wounds, overgrown beaks and nails, ingrown feathers, feather picking, confinement cramps in the legs from a cage that is too small, weight loss, heat stroke, shock, concussion, egg binding, diarrhea, mites, colds, baldness, scaly legs, sore eyes, tumors, constipation, and diarrhea. First you can try and isolate the bird in a hospital cage where you cover all but the front of the cage and add a light bulb or heating pad to keep the interior of the cage at a constant temperature of 85° F. Remove all perches and put food and water dishes on the floor. If you don't see improvements within a few hours, take the bird to an avian veterinarian for diagnosis and treatment. Red-headed Parrot Finches are not very common or often available and are rather costly. I am looking to get started breeding the Red-Headed Parrot Finches. Please contact me, if you have any to sell. I am located near Dallas, TX. Thanks. What a very intersting article on Parrot Finches. We have about 25 in our garden aviary and they are breeding well. We hope to sell some pairs this coming season. They are delightful little birds and are first up in the morning and the last to go to roost at night. Our aviary is quite large and houses about 80 birds. So the Parrot Finches spend their days with conures, turquiosines, elegants, bourkes, and doves etc. Con respecto al diamante papagayo (erythrura psittacea)para mi no es dificil de criar,el secreto esta en la dieta dando una buena mescla de semillas ,frutas y berduras mas el alimanto balanciado para pollos bb,conchilla ,carbon de le�a y arcilla, que es lo que yo uso y me da muy buen resultado.No uso calefaccion ,los crio en un jaulon, barias parejas juntas pero no les dejo los huevos los recolecto y se los pongo a los mananes, auque no sea natural ,los manones son mejores padres. (Y lo mas importante de todo ponerles ba�adera todos los dias sin importar la temperatua ambiente). Translated to English: With respect to the diamond papagayo (erythrura psittacea) mine is not difficult to raise, the secret is in the diet giving a good mix of seeds, fruits and berduras but alimanto balanciado for chickens bb, conchilla, coal of le�a and clay, that is what I use and gives very good resultado. No use me heating, crio in jaulon, together even baryes but I do not leave eggs them I collect them and I put them to mananes, auque is not natural, manones are better parents. (and but the important thing of everything to put to them all the days without concerning temperatua ba�adera atmosphere). Just got a pair of parrot finches. Finding them to be very agressive with my Gouldians. He is much more agressive than her. Any suggeestions as to what I can do to help them settle in? Yes, the new finches would be a little agressvie toward the Goulidaisn. The Gouldians are a little more laid back. Finches are a little more high energy and flight. The male would be more agressive as he is probably thinking he is protecting the female or he is protecting the female. In any case, these birds should not be housed together.